Effective, Long-Lasting and Safe - The Teosyal® range, manufactured in Switzerland by Teoxane Laboratories and distributed in the UK by Lifestyle Aesthetics (now Teoxane UK), consists of several monophasic hyaluronic acid based products of non-animal origin, which are highly biocompatible, offering patients immediate and long-lasting results. Its high hydrating capacity can absorb upto 1000 times its own weight in water and is visco-elastic to mainain the skins elasticity and form a dense, interlocking mesh. Certain products in the Teosyal® range are now delivered with 25g Ultra Thin Wall needles. Teosyal® was launched in the UK in 2005. Non animal stabilized hyaluronic acid. No. The Hyaluronic Acid is 100% non-animal origin and non-allergenic, no allergy test is required prior to injection. 25mg/ml of HA, 2 x 1ml syringes per box. Ultra Thin Wall Needles which offers an injection comfort similar to standard 28G needle. 25mg/ml of HA, 2 x 0.5ml syringes per box. Designed for touch-up sessions when completing Teosyal Global Action treatments. 20mg/ml of HA, 2 x 0.7ml syringes per box. It is injected into the surperficial dermis and is recommended for the treatment of fine lines and superficial wrinkles (such as crow`s feet). 25mg/ml of HA, 2x 1ml syringes per box. Ultra Thin Wall Needles which offers an injection comfort similar to standard 25G needle. It is injected into the mid to deep-dermal layer and is a dense and voluminous implant used to treat deep nasal furrows, lip augmentation and the facial contours of the cheeks and jaw line. It is injected into the deeper layers of the dermis. 25mg/ml of HA, 2 x 1ml syringes per box. Ultra Thin Wall Needles which offers an injection comfort similar to standard 25G needle. Teosyal Kiss is highly viscous and boasts high filling power for the lips. It is designed for reshaping lip contours, increasing lip volume, treating wrinkles around the mouth, supporting lip corners and rehydrating the lips. It is injected into the deep-dermal layer and is the Teosyal range’s densest product, achieving an immediate volume-boosting effect. It is designed for creating or restoring facial volumes, resculpting facial contours, treating deep wrinkles in thick skin, erasing folds in the skin, correcting minor ptoses and restoring the face’s original curves. An Independent study managed by S.J. Falcone et al, and published in Dematological Surgery (2009), has shown that Teosyal® Ultra Deep is the longest lasting filler on the market, among 18 commercialized dermal fillers. 22mg/ml of HA, 1 x 3ml or 2 x 1ml syringes per box. It is injected into the sub-dermal layer and is recommended for remodelling faces requiring large volumes of product. It is designed to create volume in the upper cheeks, cheeks and chin and for correcting deep skin depressions. It is the newest addition to the Teosyal® range. 15mg/ml of HA, 2 x 1ml syringes per box. It is injected into the superficial dermis and is recommended for the rehydration of the dermis (of the skin), on the face, neck, hands and décolleté. For more information, please our Teosyal Meso page. The new complete Teosyal® PureSense range with Lidocaine is now available in the UK. The latest Teosyal® Hyaluronic Acid gels are extremely pure, monophasic and homogeneous, and therefore are less vulnerable to free radical degradation. The painless hyaluronic acid injections* use a formula including a local anaesthetic which is recognised worldwide in medicine and surgery: lidocaine. *Multicentre study France 2010 carried out on 32 patients by Drs Trevidic and Claude, specialists in Plastic, Reconstructive and Cosmetic Surgery. 9/10 patients found the injection significantly less painful than an injection not containing lidocaine. The study also found than 99% of patients who were injected with PurseSense were willing to be injected again. All the products listed below are now available with lidocaine as part of the PureSense range, for more information on the range please see above. Teosyal PureSense Ultimate, Intense Volume - The longest lasting filler on the market now exclusively available in a 3ml syringe to treat the entire face. TEOSYAL® RHA (Resilient Hyaluronic Acid) is based on hyaluronic acid designed to support the skin in every move, while helping to preserve the vitality and softness of your face. It is suitable for the most mobile areas of your face: perioral area (around the mouth), cheeks, nasolabial folds, forehead, and crow’s feet. The TEOSYAL® RHA products were created according to a patented process, making it possible to meet the specific requirements of mobile facial areas. This technology better preserves the natural characteristics of the hyaluronic acid molecules to obtain gels with high purity, close to the natural content of hyaluronic acid in the skin. TeoPen is the first cordless, motorised hyaluronic acid injection system. Teoxane Laboratories have created the innovative Teosyal Pen which is at the forefront of miniature medical device technology. It allows practitioners to bring their art to life and provides comfort to patients throughout administration of the dermal filler treatment. Practitioners may also recommend using the Teoxane Cosmeceuticals skincare range alongside the Teosyal dermal filler treatment as an aftercare treatment. Trials indicate that the majority of the Teosyal® range is effective for an average of 6 to 9 months for the treatment of wrinkles. An independent study managed by S.J. Falcone et al, and published in Dematological Surgery (2009), shows that Teosyal® Ultra Deep is the longest lasting filler on the market, among 18 commercialized dermal fillers. The study found that Teosyal® Ultra Deep came number 1 in the prediction of persistence for polysaccharide dermal fillers based on the filler formulation concentration and elasticity as measured according to the tan (0.149 for Ultra Deep) Fillers with higher concentration and higher elasticity are predicted to be more persistent and effective. This information was declared as the results of an independent study and not sponsered by Teoxane. Teosyal® Kiss is manufactured in such as way as to obtain a longer-lasting effect - averaging 9 to 12 months, Teosyal® Ultra Deep is said to last 12 months on average, with Teosyal® Ultimate quoted as a 12 to 18 month average duration; these are according to the manufacturers. This depends on area treated, the specific product used and how much is required, and the practitioner doing the treatment, but ranges are in the region of: £200 to £400 per treatment. Teosyal® Ultimate will cost approximately £600 per 3ml syringe. Nasolabial (nose to mouth) lines before treatment with Teosyal®. Improvement in nasolabial lines after treatment with Teosyal®. 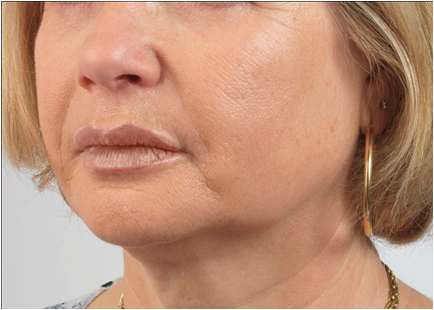 Lips and perioral (around the mouth) lines before treatment with Teosyal®. Improvement in lip volume and perioral lines after treatment with Teosyal®. Nasol-labial folds in a male, before treatment with one syringe of Teosyal® Ultimate. Improvement in facial contours after treatment. Photograph taken one week after treatment. For more information please visit the Teoxane website. Click for ALL Teosyal ® clinics in the UK & Ireland registered and verified by Consulting Room. 3 out of 5 based on 16 customer reviews.